California is bracing for a life-threatening and potentially historic storm today, February 17, with the arrival of some of the nastiest weather to hit the state in many years. Conditions will go downhill in a hurry through the day as the dreary slog of driving rains, gusty winds, and intense mountain snows blankets the Golden State to begin the weekend. The latest forecasts from the National Weather Service paint a bleak picture for California and its sprawling countryside. A sustained thump of heavy rain will cover the state during the day on Friday, but the system will begin to pick up steam as it approaches shore closer to nightfall. Heavy rain and strong winds don't seem like too big of a deal to most of us around the country, but California, with its population of around 39 million, is home to more people than 22 other states combined. Any major weather event that affects such a large segment of the population will create huge problems, especially in such a disaster-prone region of the country. Several inches of rain are possible just about everywhere in California save for the mountains, where the precipitation will fall as many feet of snow, and the southern half of the Central Valley, where the Coast Ranges will block rain from reaching the low-lying center of the state in a phenomenon known as a rain shadow. The heaviest rain will fall in southern California near Los Angeles, where up to six inches of rain are possible in the more intense showers and thunderstorms that develop. Rainfall totals could reach record territory in L.A., where this storm could make today one of the 10 wettest days ever recorded at Los Angeles International Airport, and it could come close to the top of the list in downtown L.A. The storm system causing all of the trouble could rank among some of the strongest low-pressure systems ever recorded off the coast of California; some weather models are predicting a minimum central pressure lower than 990 millibars—a pressure you'd expect to find in a weak hurricane. Flash flooding will be a major concern in areas that experience sustained heavy rainfall. The National Weather Service's latest assessment of the flash flood risk in California shows that rainfall rates of only around one inch of rain per hour could lead to flash flooding. The threat for flooding from this storm is compounded by multiple factors that many other parts of the United States don't have to worry about, including rough terrain, burned ground from wildfires, and the fact that the soil is still recovering from the years-long drought that's just now starting to wane. These natural factors, in addition to urban sprawl, limit how quickly rainwater can run off into sewage systems and natural waterways. Areas that suffered under an immense drought for most of the past decade wished for rain every winter, but this winter's steady rains have been too much of a good thing. Not only do residents now have to worry about flash flooding and mudslides, but folks who live downstream of the Oroville Dam have some extra concerns. 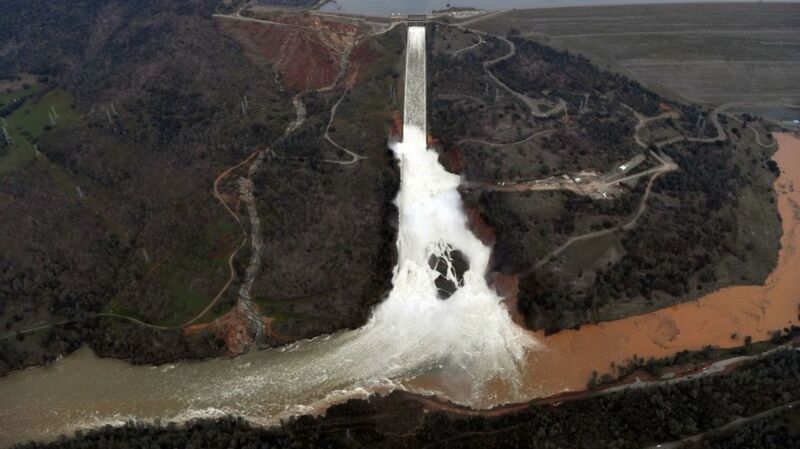 Recent rains pushed Lake Oroville, situated north of Sacramento, California, beyond its capacity, sending water cascading down its two spillways. Tens of thousands of people had to evacuate last week when the dam's emergency spillway came perilously close to failing due to water eroding the soil and rock near the structure. The lake's water level has slowly receded in the days since, but this rainstorm could push water back to the same dangerous level we saw just a couple of days ago.